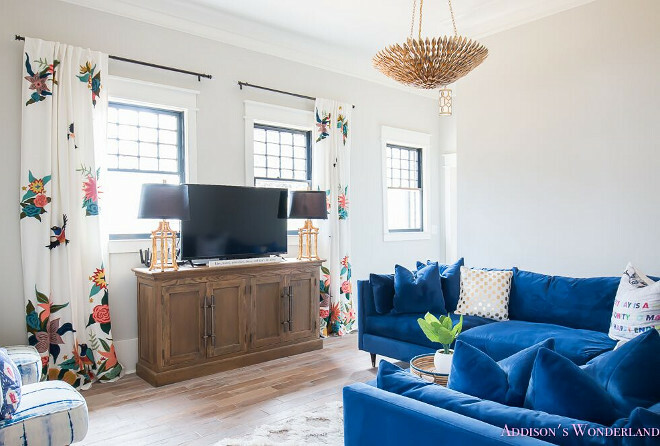 I am so happy to be featuring Brittany Hayes’ home from Addison’s Wonderland on our Beautiful Homes of Instagram series. 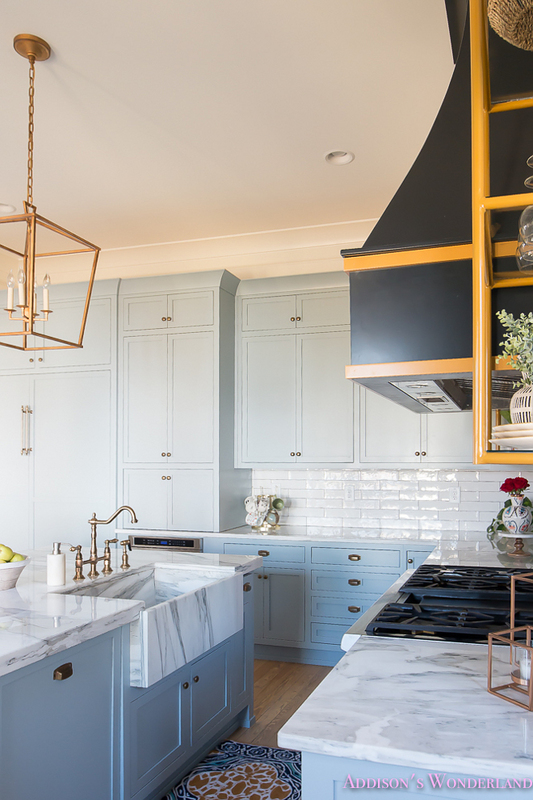 I invited Brittany to be here today because she and her husband just finished restoring a historic Craftsman style home and they designed a kitchen that I think is one of the most beautiful kitchens on Instagram! 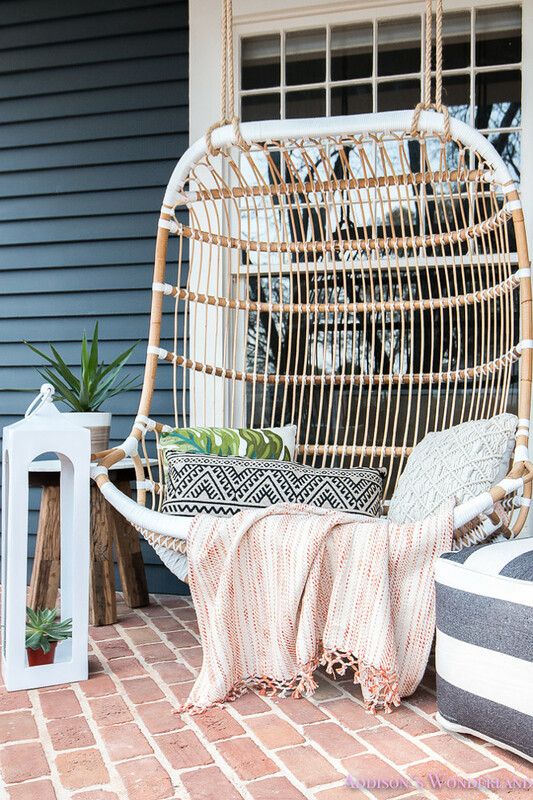 Get to know more details about Brittany’s home and make sure to follow @addisonswonderland on instagram for more photos! Welcome to our home!!! 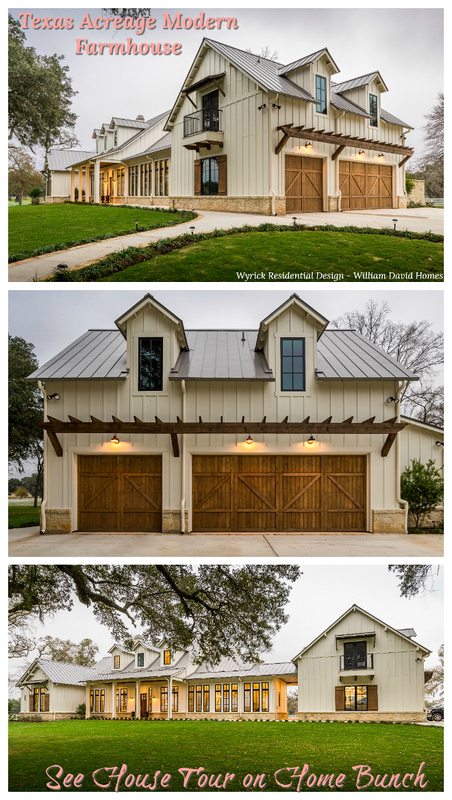 Our 1905 historic craftsman… Our Historic Wonderland! The home we purchased as a gutted 2 x 4 “shell” one year ago and have since transformed and restored into our dream home. Well, the construction is complete and my design fun has just begun! As amazing as it is to be finished and actually living in our home, I am almost sad sometimes that the journey of restoring it is over. 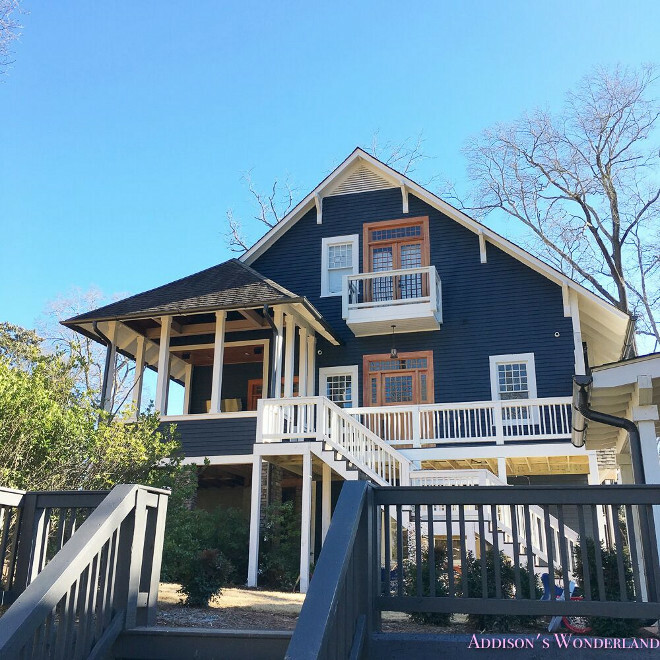 It truly does not even seem that long ago when I posted that we had found the home and project of our dreams and that we would be selling the home that jumpstarted my blog. This house literally spoke to us from the moment we stepped into the front door on a freezing cold and pitch black Friday evening that November. From there our journey to creating Our Historic Wonderland began. 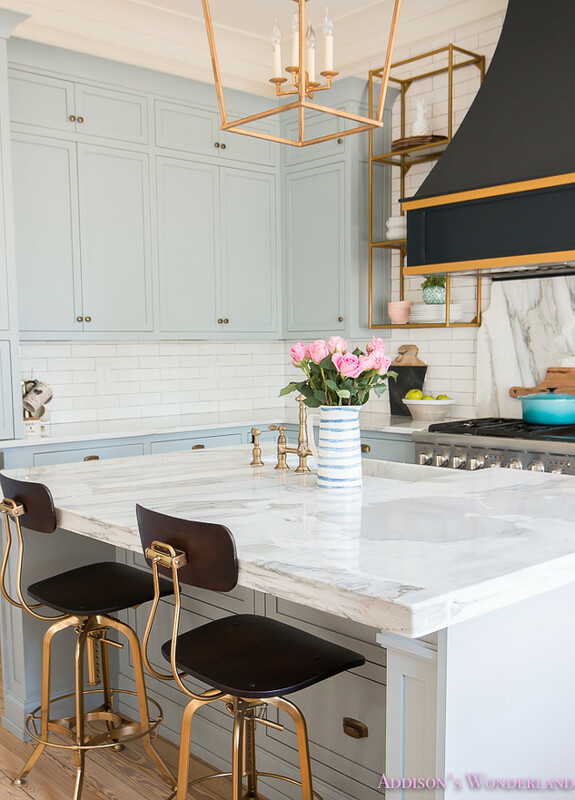 I am still so excited to see where the interior design transformation will take me and I hope you will continue to follow along! 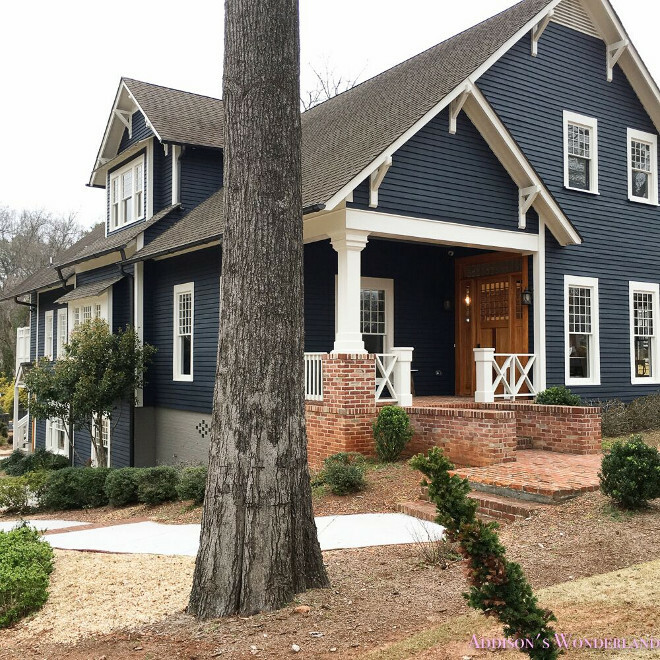 Exterior Paint Color: 1/2 Soot by Benjamin Moore and 1/2 Witching Hour by Benjamin Moore. 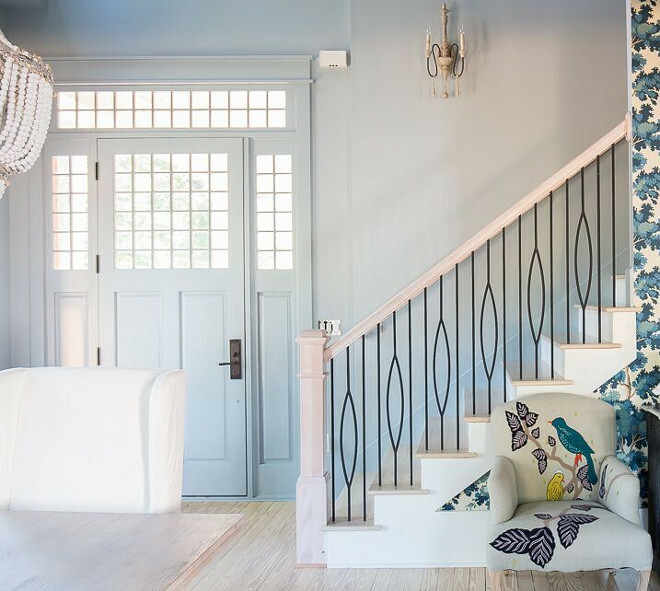 Trim: Dove Wing by Benjamin Moore. 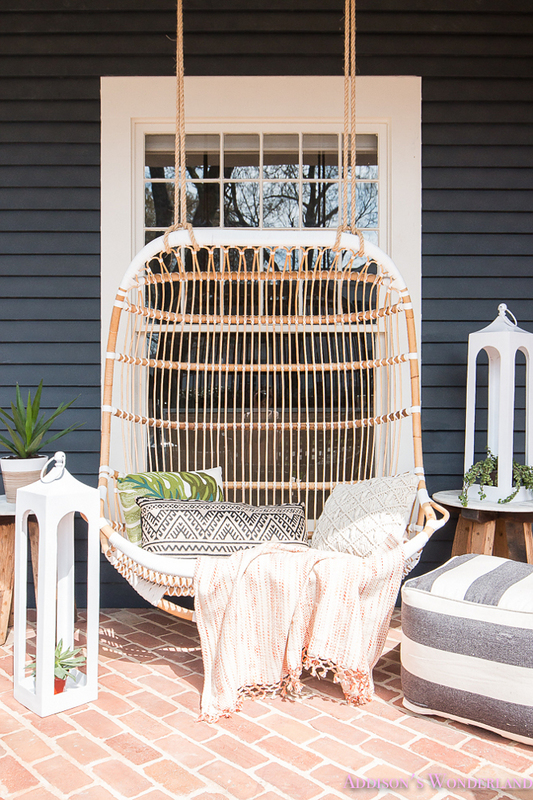 Rattan Swing: Serena and Lily. Lantern is Caleb Lantern White by Pottery Barn. 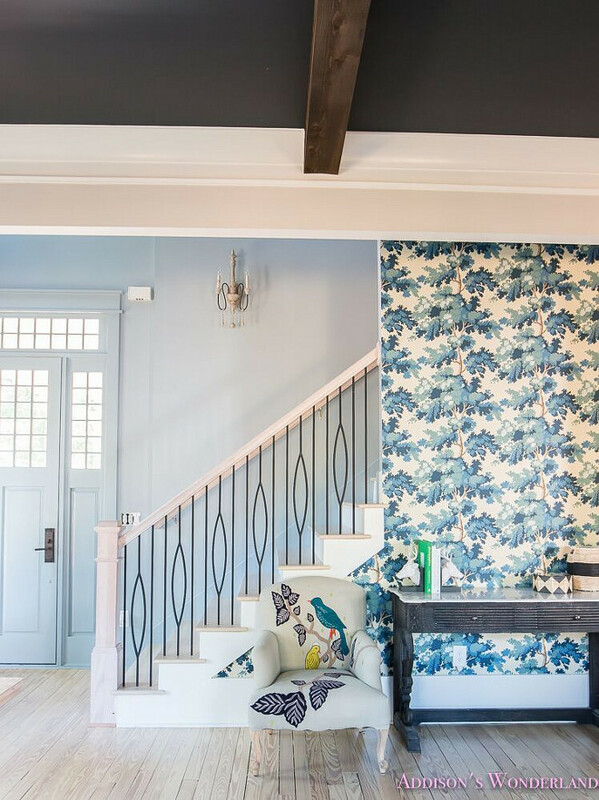 Brittany’s foyer is full of character and beautiful ideas! The wallpaper is Sandberg Raphael Green Floral Wallpaper. Chair is Treescape Dorrance Chair, Birds by Anthropologie. Stair Balusters: House of Forgings. Front Door Paint Color: 1/2 Stardew by Sherwin Williams with 1/2 Uncertain Gray by Sherwin Williams. 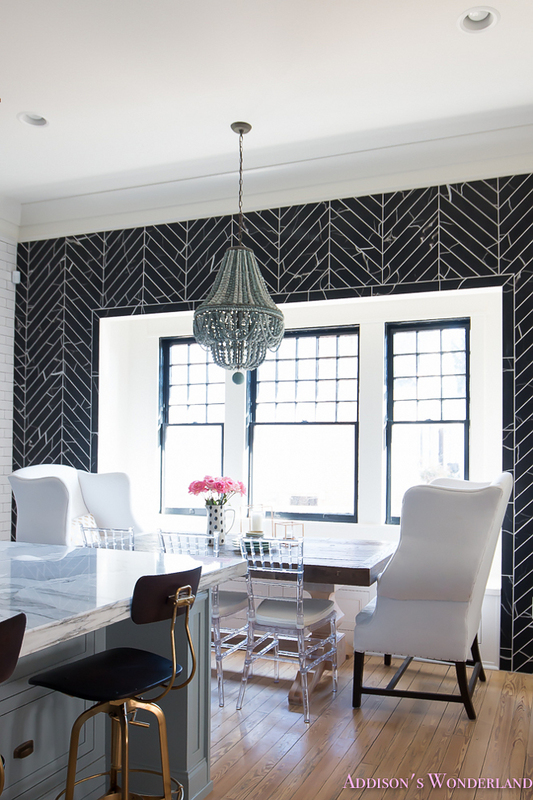 Dining Room Wallpaper: Nuvolette Wallpaper. The chest between the windows is from HomeGoods. 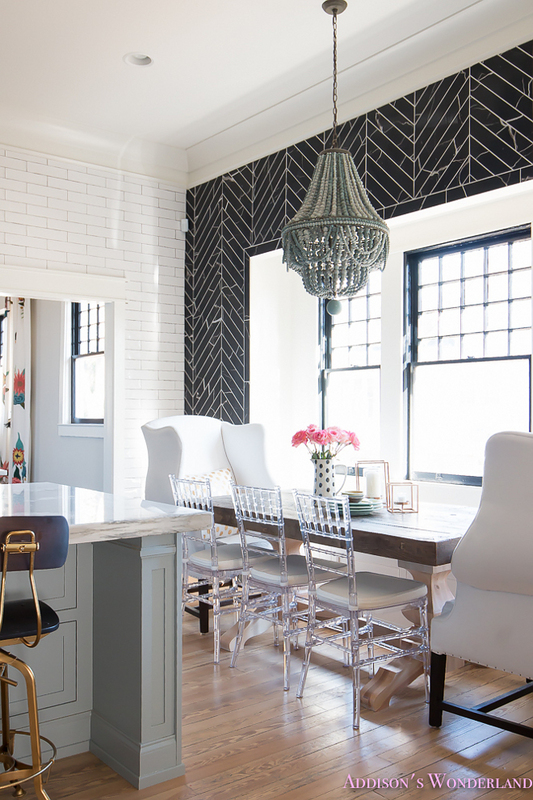 How perfect is this dining room, right?! 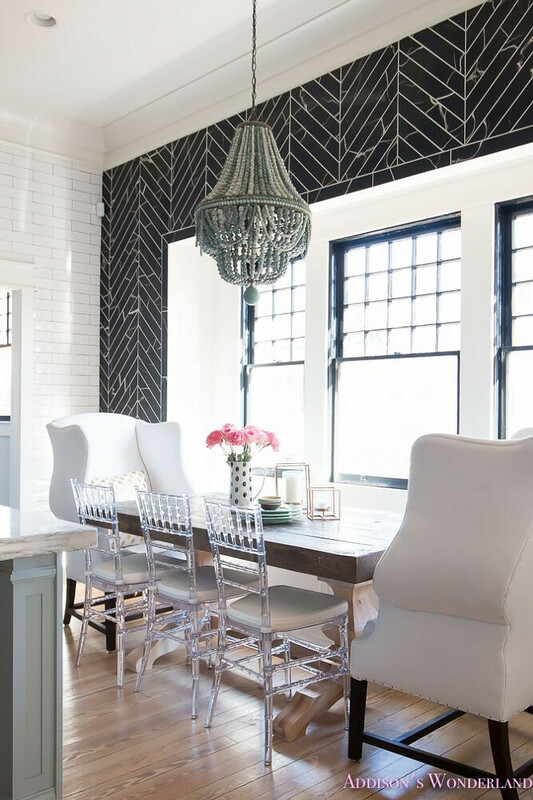 The dining table is from Anthropologie – no longer available. Rug: Surya Alfresco Machine Woven Beige/Moss Indoor/Outdoor Area Rug. 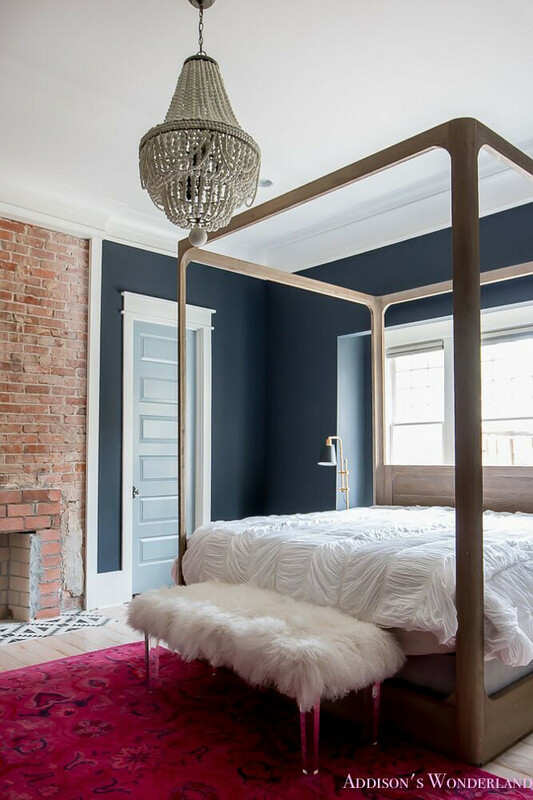 Paint Color: Walls: Gossamer Veil by Sherwin Williams. 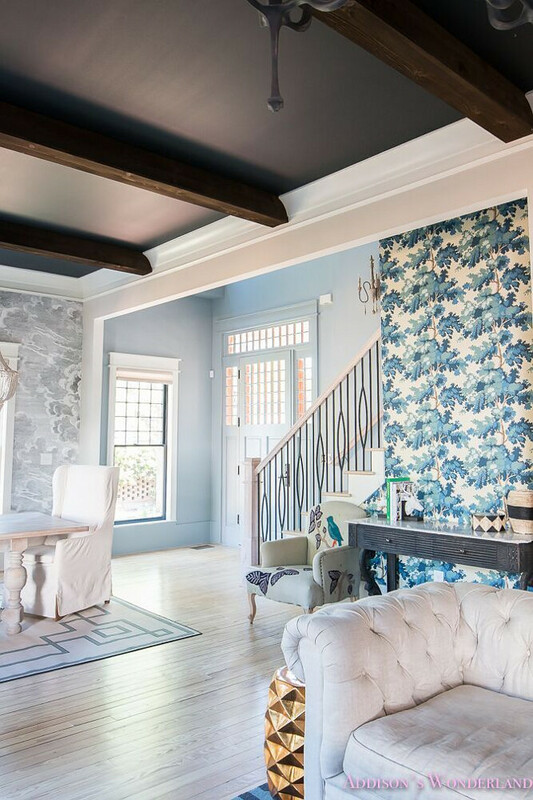 Ceiling- Inkwell by Sherwin Williams. Beams: Dark Walnut by Minwax. 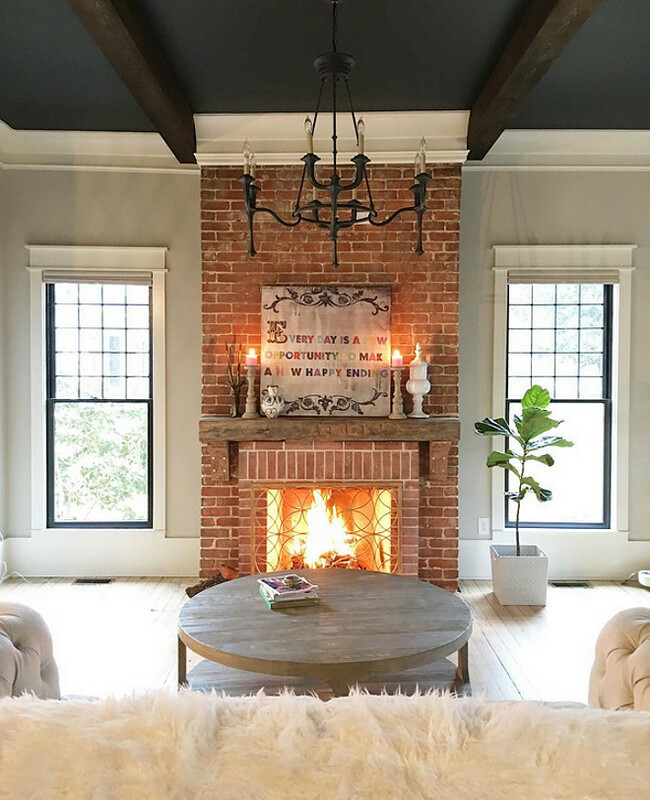 Can you picture yourself relaxing with a good book by this brick fireplace? Art is by Sugarboo Designs. 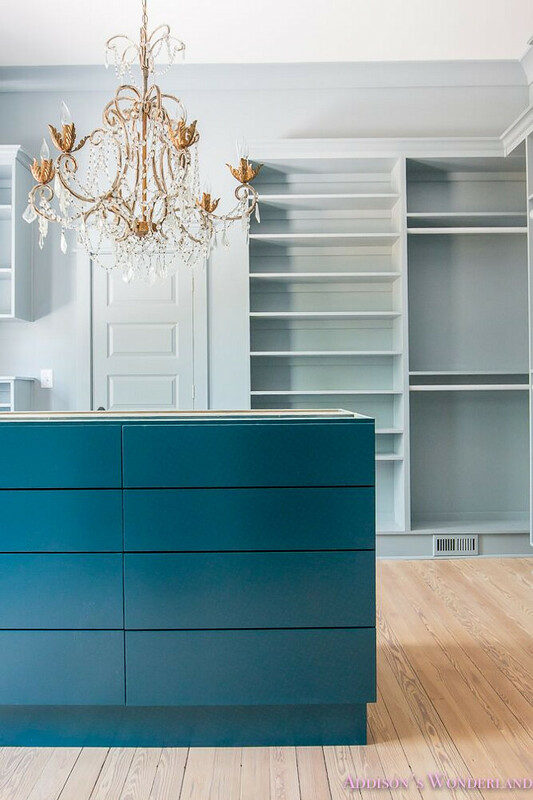 This stunning blue kitchen features blue shaker cabinets painted in a custom color, 50% of Sherwin Williams Stardew and 50% Uncertain Gray by Sherwin Williams. 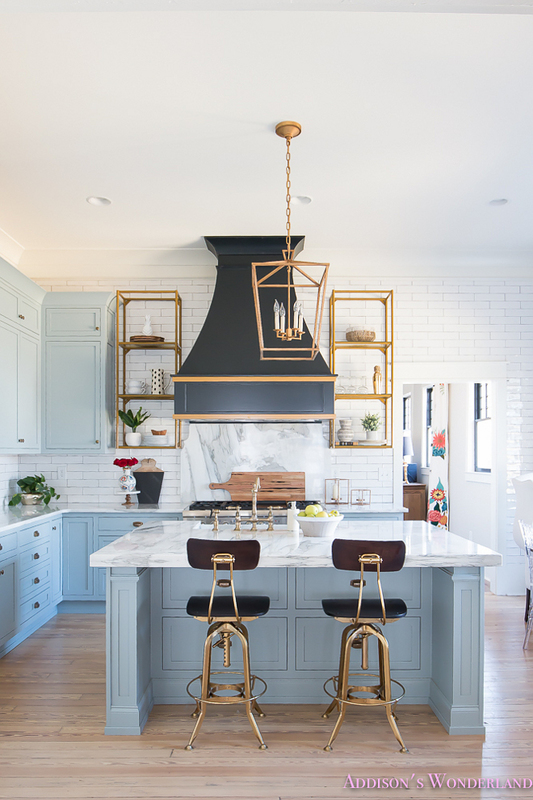 This is truly one of the most beautiful kitchens I’ve seen lately! 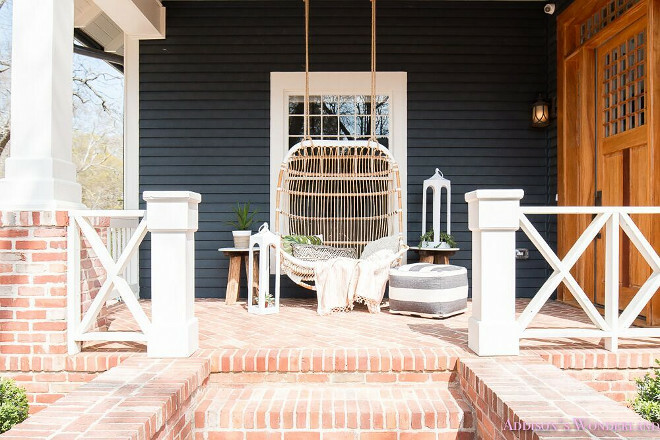 Wall & Trim Color: Alabaster by Sherwin Williams. 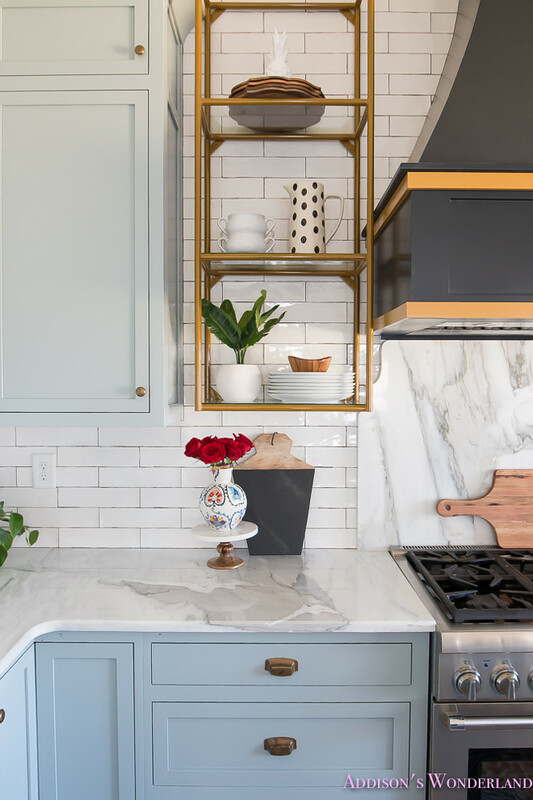 Thick Countertop: The kitchen features Calcutta Gold Marble Countertop. 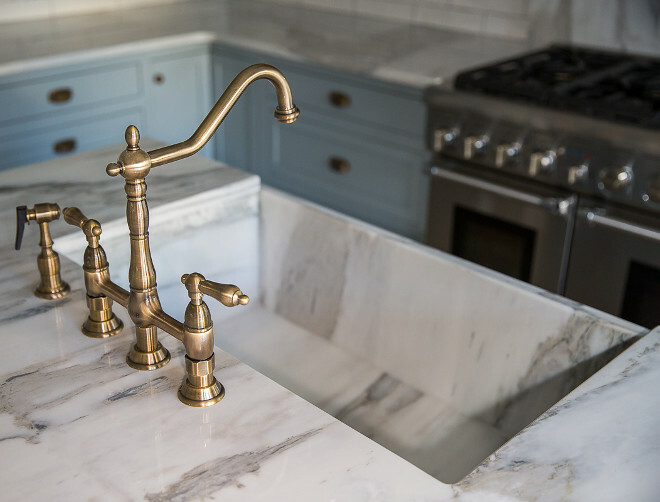 This farmhouse sink is made of the same countertop material – Calcutta Gold Marble Slab. Isn’t it amazing? 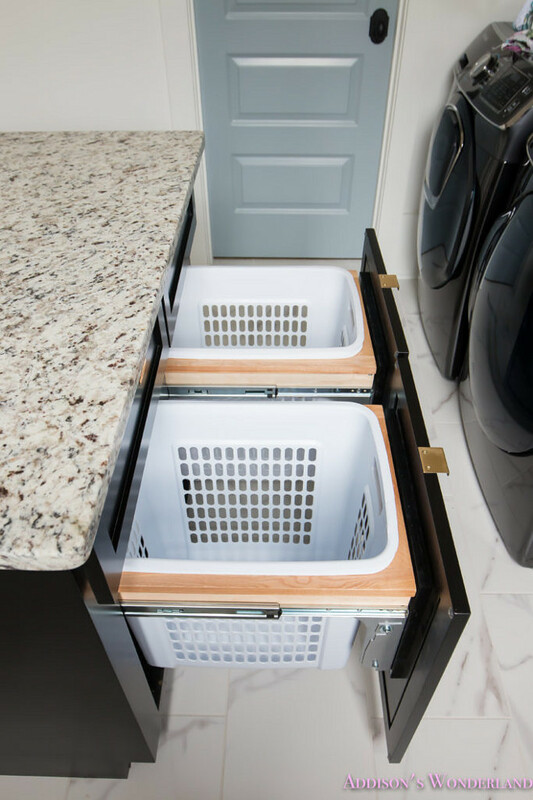 Hardware: Pulls: Richelieu America Oxidized Brass Bin Pull. Knobs: Classic Brass Classic Antique Brass Knob. 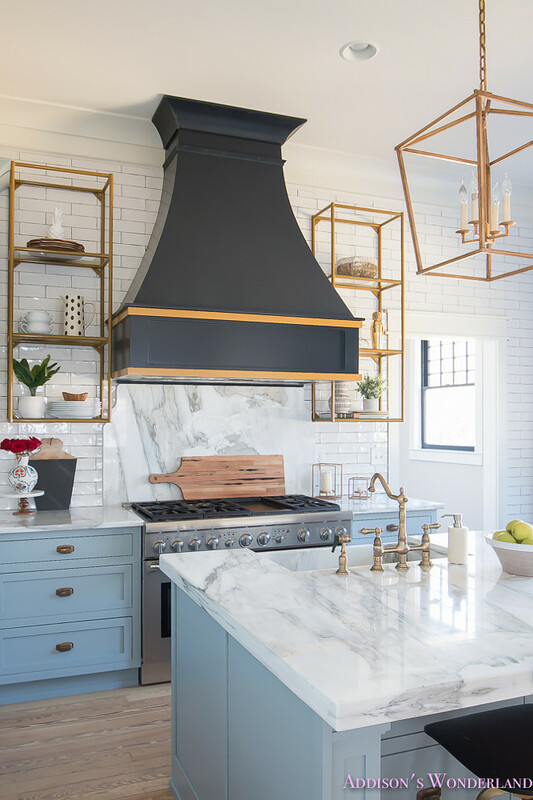 A black French kitchen hood, painted in Sherwin Williams Inkwell, is accented with gold trim and it’s flanked by brass shelving. 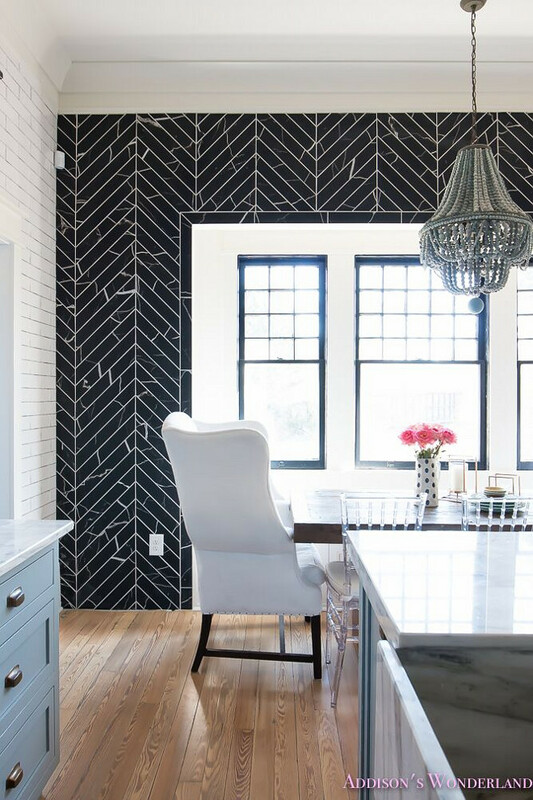 Backsplash is a white crackle subway tile with black grout, and marble slab behind the range. The industrial barstools are Restoration Hardware Vintage Toledo Bar Chairs. Kitchen lighting is Darlana Lantern. 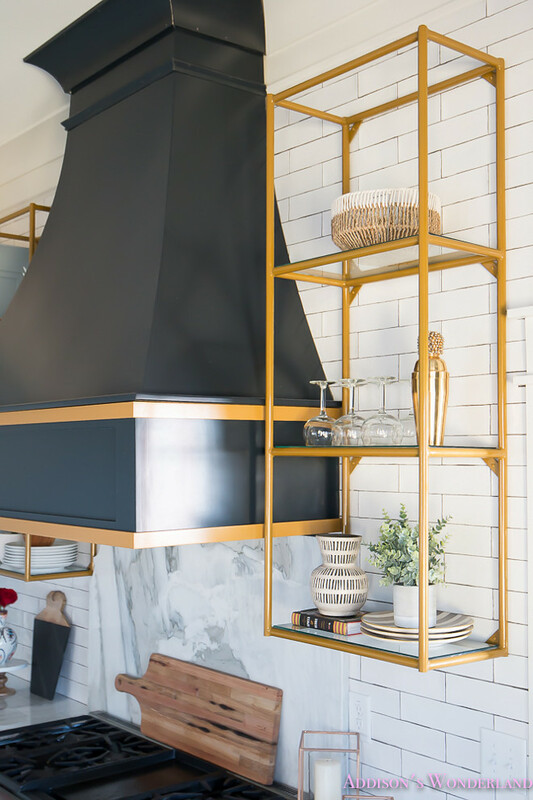 The brass shelves are from Blackstocks. 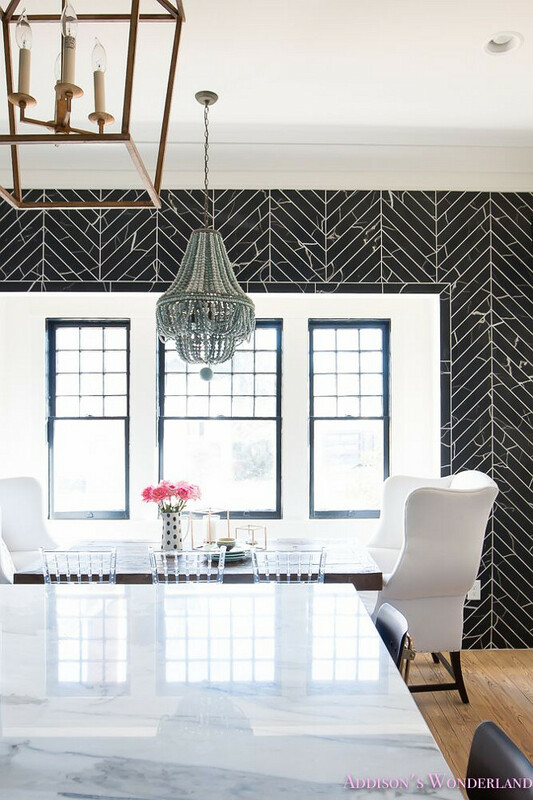 The breakfast room features black marble chevron tile. 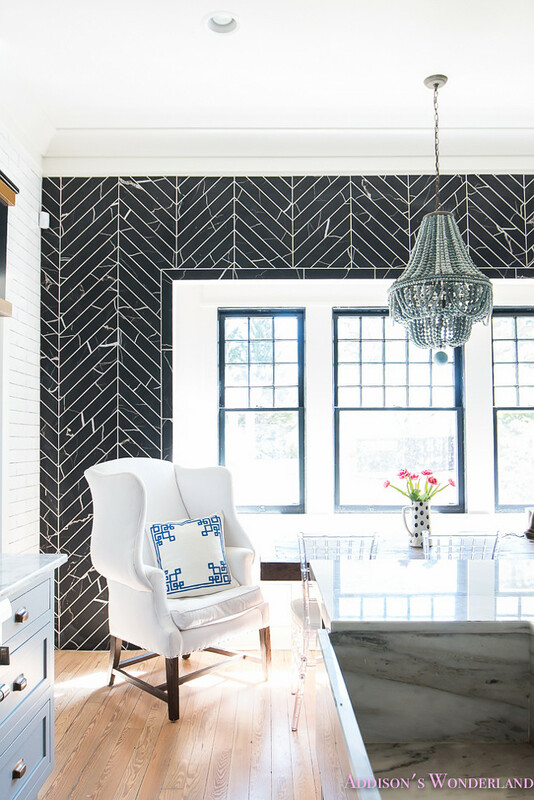 Marble is Nero Marquina Black Marble. Dramatic and stunning! Flooring: The homeowners restored the GORGEOUS 111 year old hardwood floors. 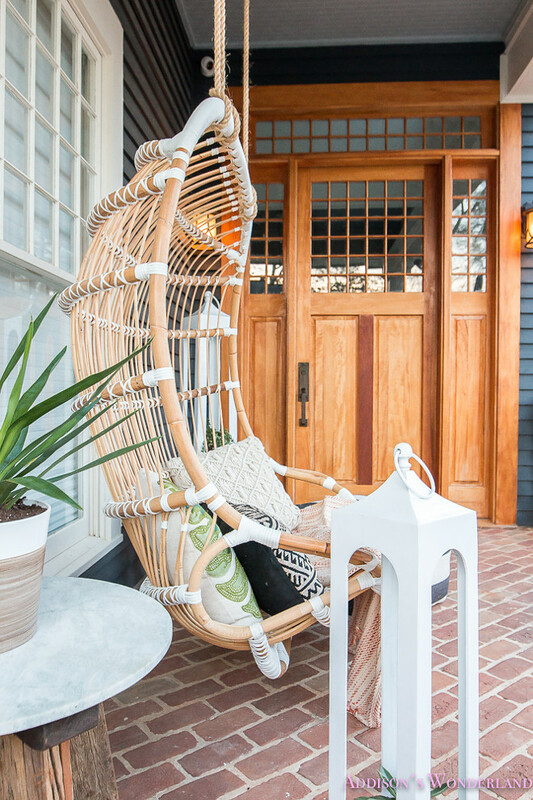 Chair is from Restoration Hardware. Window Sashes Paint Color: Inkwell by Sherwin Williams. 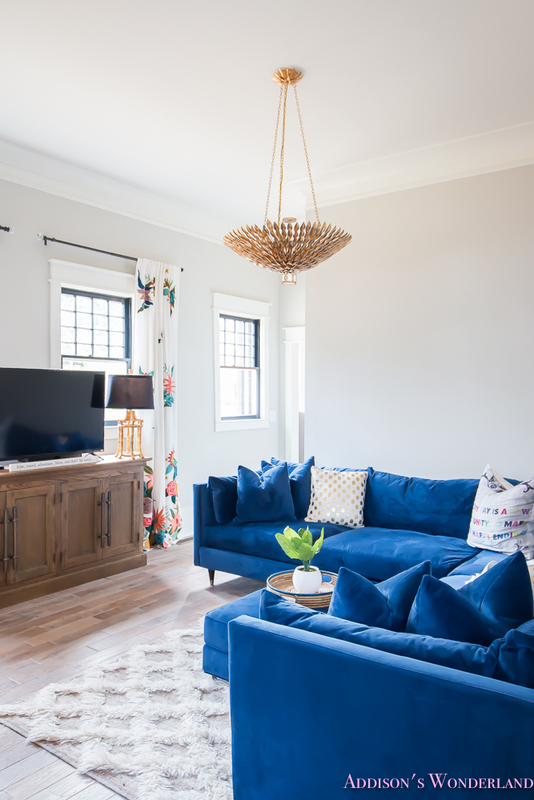 Chandelier is a Regina Andrew Design Malibu Chandelier – Blue. The lucite chairs are Clear Chiavari Chair by Flash Furniture with cushions. 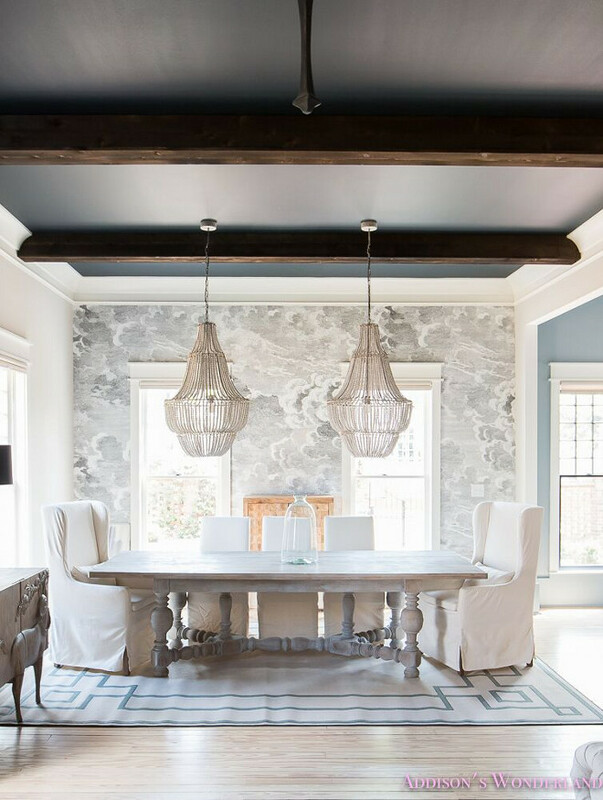 The table top is from Restoration Hardware. The bottom part is a Tall 29” High Extended Old World Double Pedestal Kits in Soft Maple from Osborne Wood. Wall paint color is Gossamer Veil SW 9165 by Sherwin-Williams. 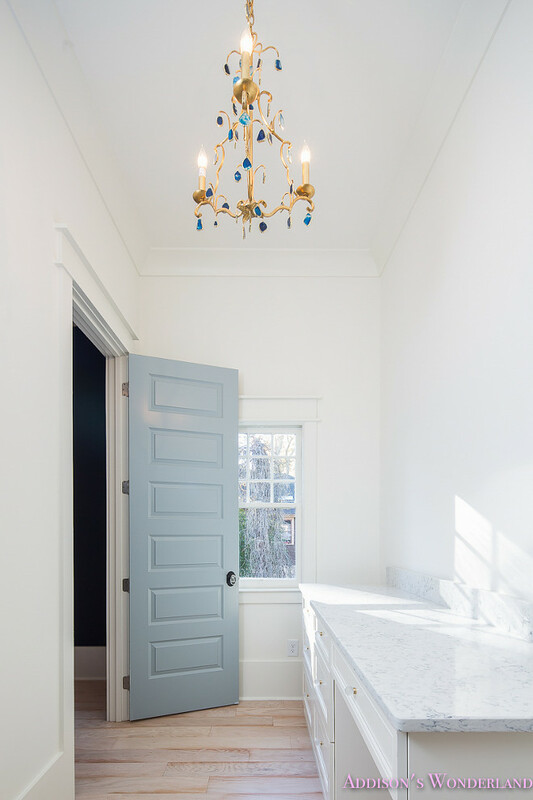 Trim is Alabaster by Sherwin-Williams. 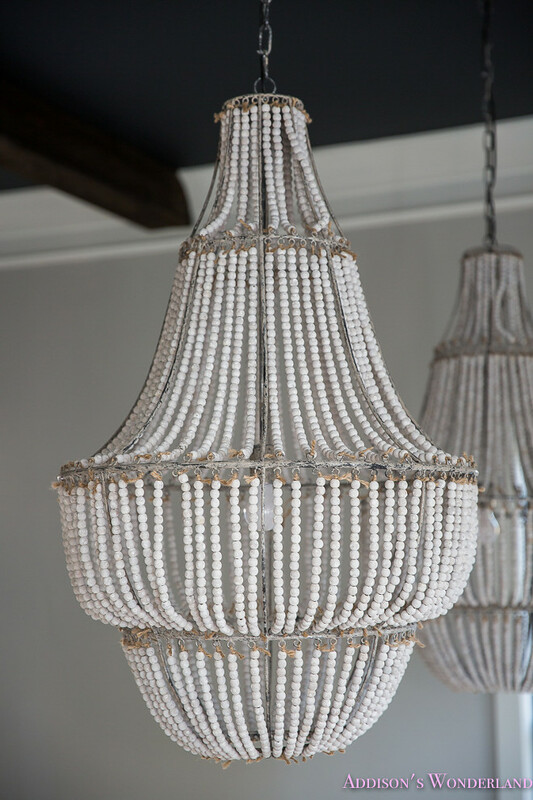 Lighting: Crystorama Broche Collection 8-light Antique Gold Chandelier. 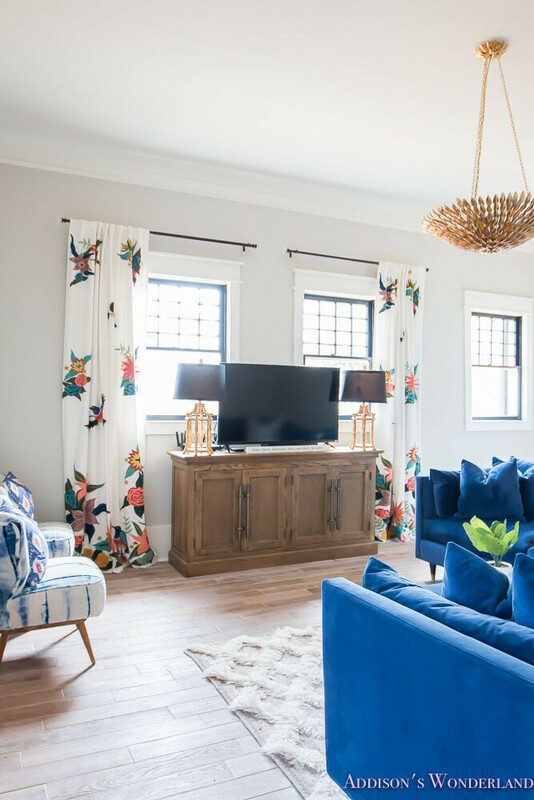 The blue velvet sectional is the Pia Sectional by Jonathan Louis Furniture. I am loving these curtains! Aren’t they perfect for spring/summer? Curtains are Anthropologie. The rug is Lattice Flokati Rug, also by Anthropologie. 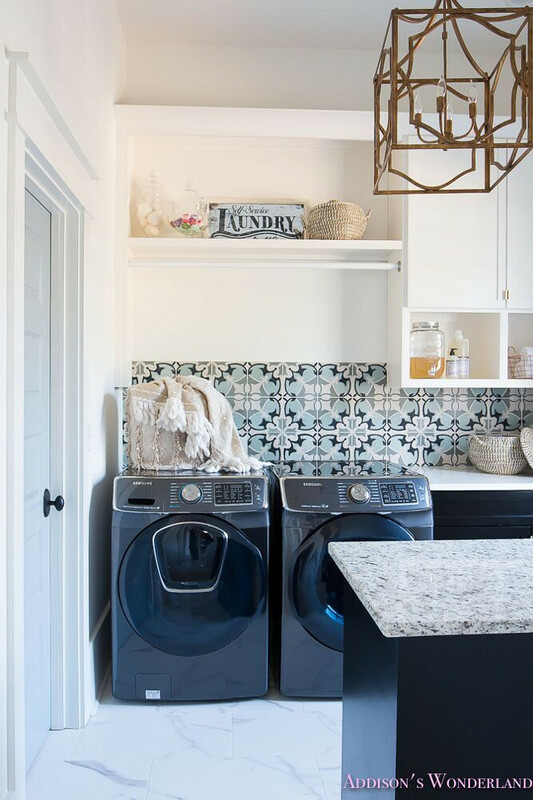 The laundry room is full of inspiring ideas, which includes the blue and grey cement tile backsplash. Love it! Two-toned Laundry Room: Laundry room features white upper cabinets painted in Sherwin Williams Alabaster. Black lower cabinets are Sherwin Williams Inkwell. 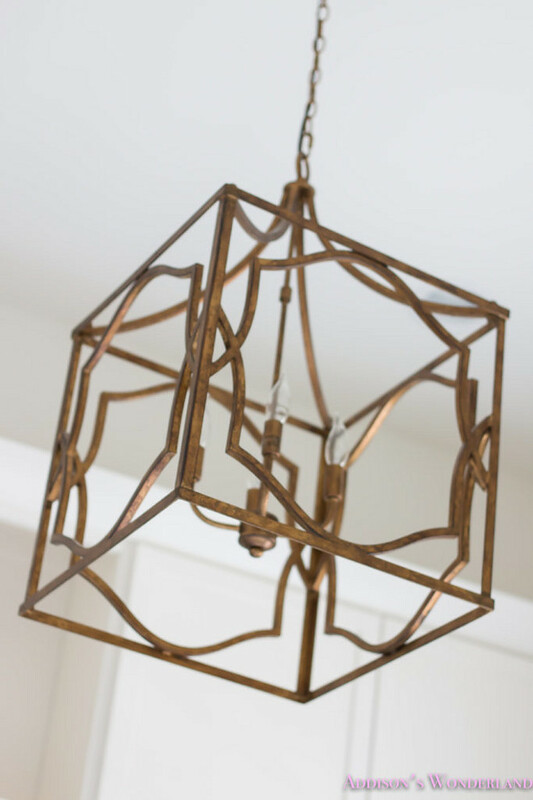 Lighting: Capital Lighting Blakely Collection 4-light Antique Gold Foyer Pendant. 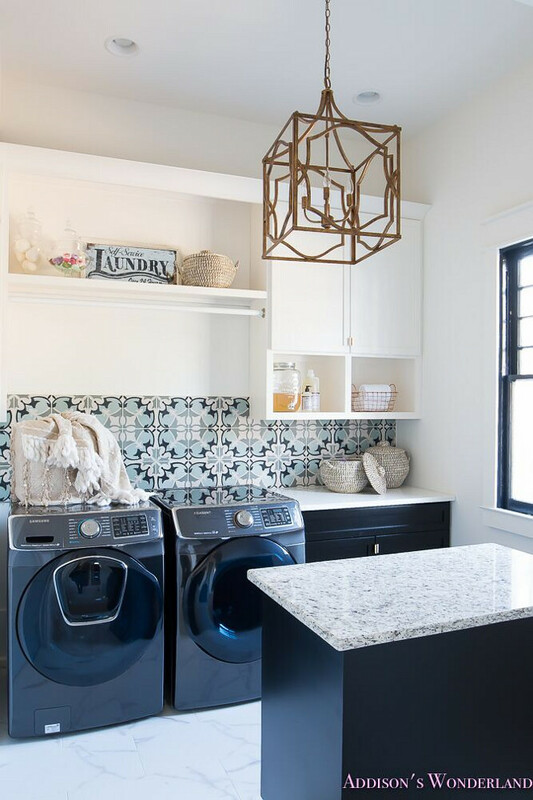 This gorgeous laundry room boasts a black island topped with white and gray granite countertop and pull out drawers holding laundry sorters. 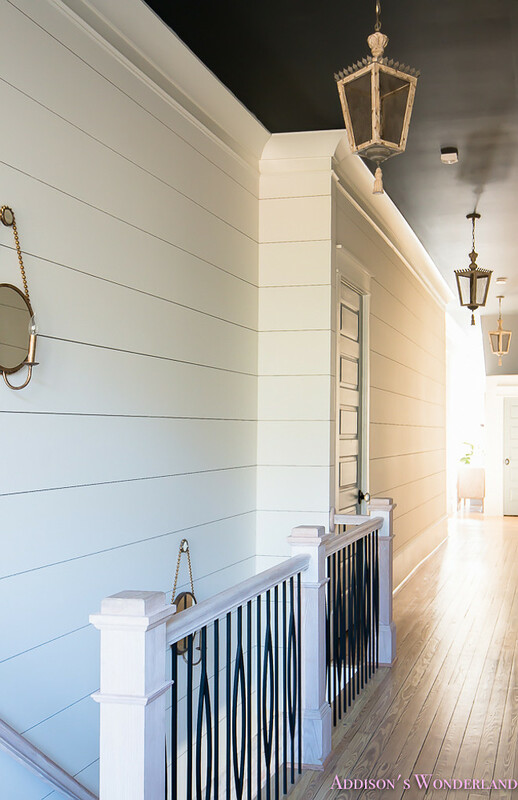 Shiplap brings charm to the staircase and hallway. 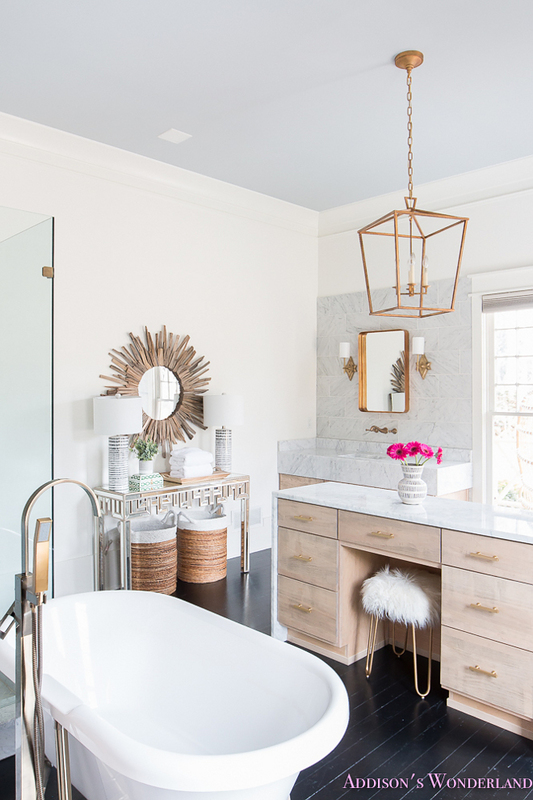 Colors: Shiplap Walls: Alabaster by SW. Ceiling: Inkwell by SW.
Sconces: Currey & Company Somerset Wall Sconce. Brittany’s bedroom is dramatic yet romantic! 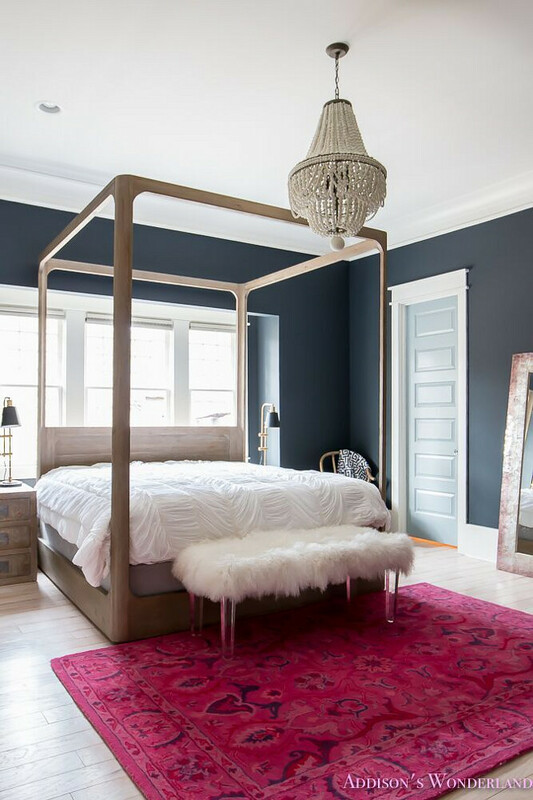 I am loving the magenta rug and that stunning bed! The wall paint color is Inkwell SW 6992 by Sherwin Williams. Bedding is Bertilia Duvet from Anthropologie. This master bathroom is a dream… I love the natural wood cabinets contrasting with the black hardwood floors and the painted blue ceiling. Walls are SW Alabaster. The mirrored console table is from Lamp Plus. 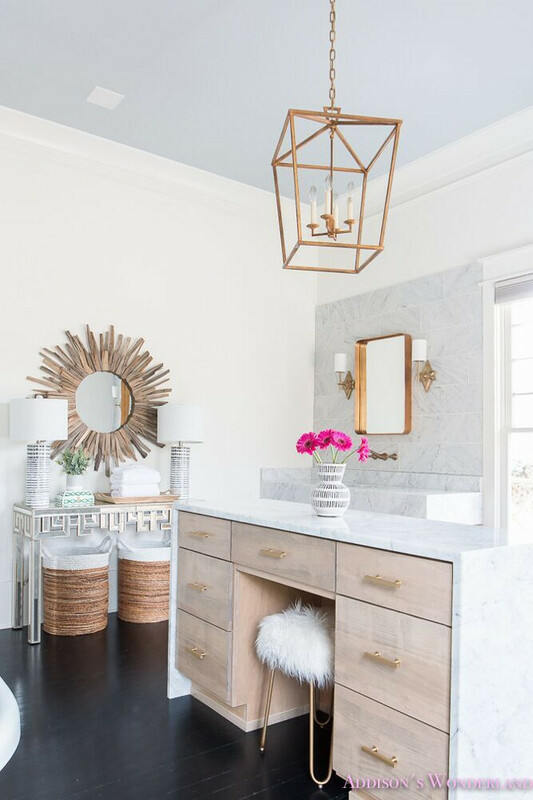 The master bathroom features a stunning island-style vanity with waterfall marble countertop. Vanity stool is Brass Fur with Hairpin Legs. 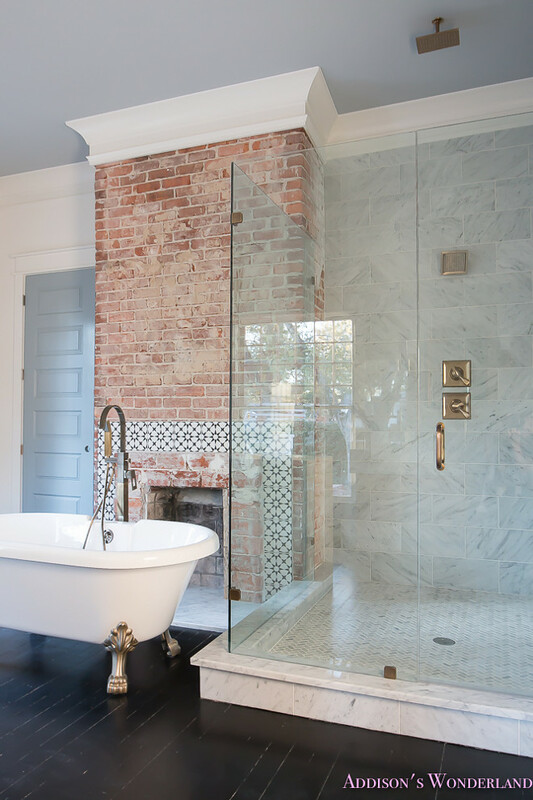 I am loving this stunning reclaimed brick fireplace with cement tile surround. Dressing room: The dressing is almost finished, just missing the countertop. 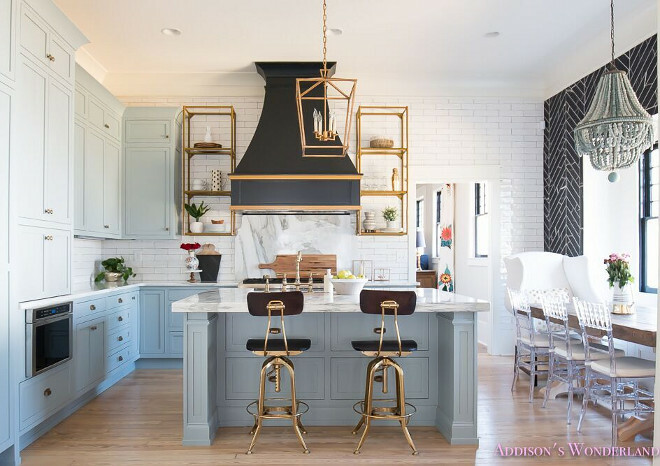 The gorgeous chandelier is from Anthropologie and the teal island paint color is Dark Harbor by Benjamin Moore. Cabinets are 1/2 Stardew & 1/2 Uncertain Gray by Sherwin Williams. 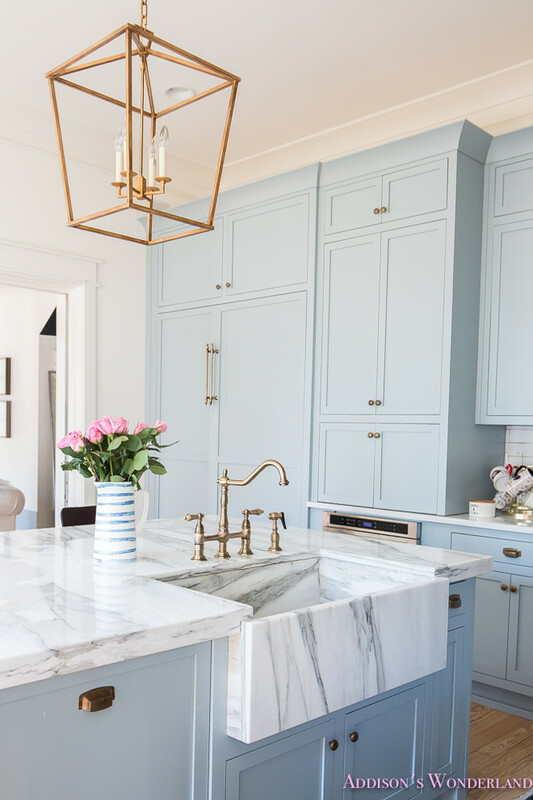 This separate dressing area features a stunning chandelier – Currey and Company Eudora Antique Gold Leaf/blue Chandelier. Make sure to follow @addisonswonderland. Some Photos By: David Cannon Photography. If you show this to a Benjamin Moore store, they should be able to mix this for you. 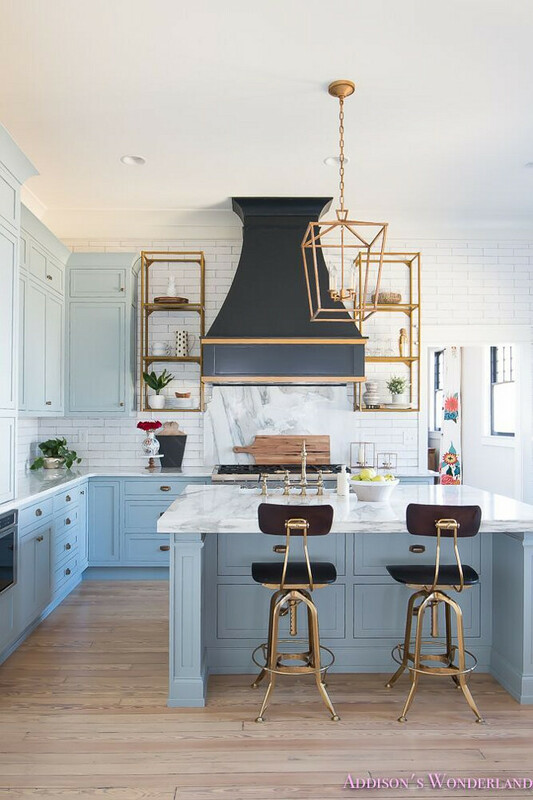 Hi there, where is the kitchen island lantern lighting fixture from?